We wrapped up a Creature Design tutorial last Sunday which was a terrific follow up to our Character Design tutorial the prior weekend. While I enjoy being on camera and leading a tutorial, it’s exhausting be on both sides of the camera at the same time. On the occasion that I get to focus exclusively on being behind the camera directing and running the shoot, it’s so fun to kick back and just enjoy watching someone else’s creative process. Guest Teaching Artists Julie Benbassat led the tutorial, while Cat Huang observed and asked questions. I’ve been familiar with Julie’s work for a while, but I’ve never seen her develop a piece from beginning to end. 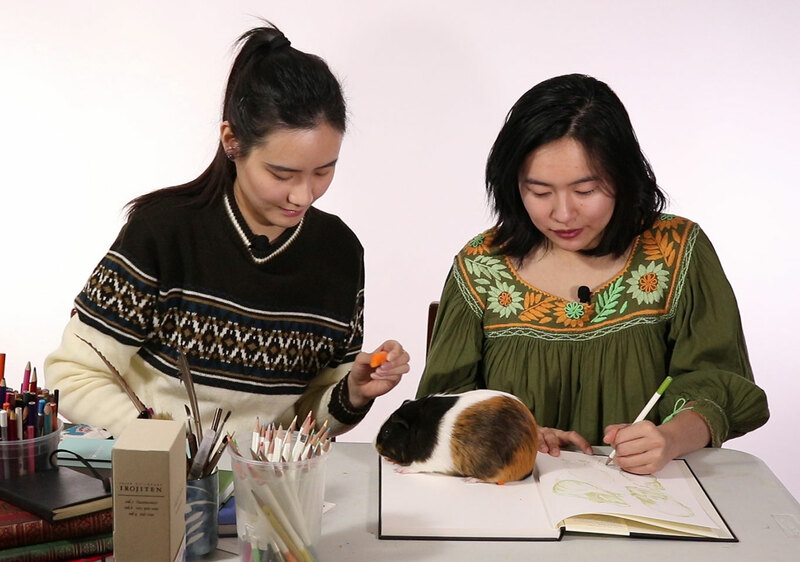 Naturally, we just HAD to include my guinea pigs, Jub Jub, Wheat, and Fluffy in this tutorial given that it was about creature design! As Julie drew the guinea pigs, she commented that their ears look like those tree ear mushrooms, and I remembered that about a year ago I had bought a bunch of weird looking dried fungus from a Chinese medicine shop in Boston’s Chinatown. I thought the fungus might be fun for my students to draw so I picked up up, but never had the chance to use them actually, so they’ve just been sitting there on the shelf. Julie ended up with a terrific blend of references: the guinea pig bodies, their feet which she extended, and the tree ear mushrooms which she ended up adding many more of beyond just the ears. My guinea pig Wheat has really long hair that goes past his body, and I love that Julie included that in her final creature design. I’m always trying to teach people how to use multiple reference material, so this was a great mix of drawing from life and imagination to come out with an image that seemed cohesive and natural. See more of Julie’s sketches and the final piece on the tutorial page! Next time you have access to an animal, do a quick sketch! 0 responses on "Guinea Pigs, Tree Ear Mushrooms, and Some Imagination"